Rock the boat! Click here to play! Don't rock the boat baby. Rock the boat! Don't tip the boat over. Enjoy the very best of the ocean, coupled with the wonder of pure, unsullied rock! 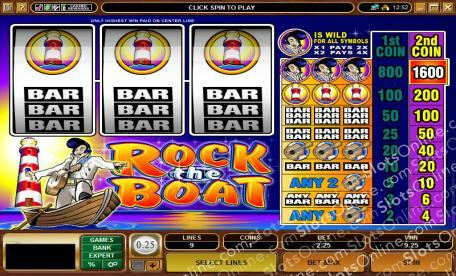 Rock the Boat is an engaging 3-reel slot played across a single pay line. Put on your finest rock wear, because it's going to be a long night of musical mayhem. The Elvis symbol is Wild and can be substituted for any other symbol on the reels in order to complete a winning pay out. If you use one Elvis in a combo, the payout will be doubled; and if you use two Elvis symbols in the winning combination, then the payout will be quadrupled! The Lighthouses, Guitars, and Bars will all pay out when you spin up three of them in a row, but three Elvis symbols will earn you up to 1600 coins. Start rocking out at Rock the Boat tonight! The Elvis symbol Is Wild and can be subbed for any other symbol on the reels. It also pays out up to 1600 coins.